Size: 4037 sq.ft. - 10161 sq.ft. Indigo Zen is a mixed use gated community that compromise of leisure facility, dining, retail areas, sports facility, villas & townhouses developments. This master plan was launched in 2014 and got completed in the Q3 of 2017 at Dubai Golf City that feature a community oriented lifestyle. Dubai Golf City is a grand development of 55 million square feet by Thani Investment. Indigo Properties is the developer of this project where they have crafted 3 BR(sold out), 4 BR, 5 BR & 6 BR villas as well as townhouses. 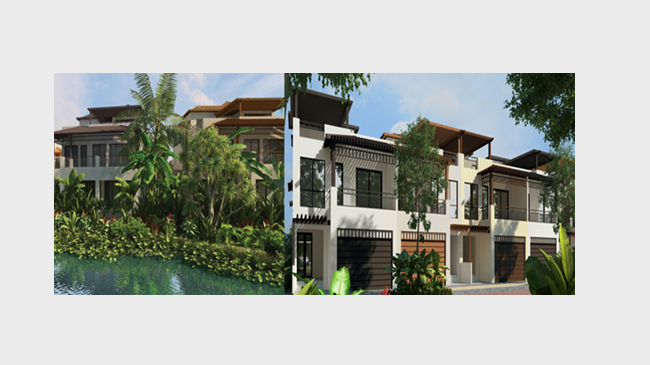 Zen homes are developed with the front view of green, flowing exotics and ponds. The project architecture is inspired by Southeast Asian Tropics and delivered with a unique architectural style. These are extremely large sized villas & townhouses being offered at reasonable rate. It is the first residential project at Dubai Golf City and the first golf course project in Mudon with completed developments. Zen by Indigo consists of sub communities like Bliss, Heaven, Harmony, Aura, Eternity, Nirvana & Serene. In Zen the Indigo Properties has housed 346 homes amidst in a tropical and verdant landscape. Bliss consists of 4 BR villas over the built up area of 5575 to 6728 Sq.ft. Heaven also consists of 4 Bedroom villas with the total area of 5919 Sq.ft. Harmony sub community has 3 Bedroom villas with area range of 4101 Sq.ft. Aura has the layouts of 4 BR onto the area of 6727 Sq.ft. Eternity is available with 5 Bedroom villa types over 7395 to 7815 Sq.ft. Nirvana comes with the choices of 6 Bedroom roomy villas over 10160 Sq.ft and the Serene offers you 5 Bedroom Villas with the total area of 7395 Sq.ft. These all types villas having two floors (Ground+First) with Designer Pools, balconies, Panoramic Glass Elevators, terraces, full height windows and smart home technology. Indigo Properties has been developing projects since 2004. Indigo Properties has delivered apartments, villas, commercial and retail projects. They are reputable developer based in Dubai and have complete numbers of projects across Dubai city. Indigo projects include Indigo Sky, Indigo Central, Orange Lake, Indigo Icon, Indigo Tower, Indigo Spectrum 1 & 2, Indigo Optima, Indigo Ville, IST Plaza and Indigo Zen. The developers are quite passionate about their work and their only aim is to bring innovative concepts to their every new project. The group have been taking individual and independent approach to developments for fulfilling needs of each client. At Indigo Zen everything is within your reach as it is in the heart of Dubai Golf City, New Dubai. Dubai Golf City is near Dubai Motor City and Akoya. The local attraction of Indigo Zen lies at 2.8 Kilometres of distance called The Els Golf Club. Zen by Indigo promise you a relaxing and calm environment with water features like fountains, lakes, waterfalls & streams. Indigo Zen villas are equipped using natural materials like marble, wood stone and wooden shingles that gives your home a unique traditional look and eco-friendly environment. Bradenton Prep School, Raffles Primary School in Arabian Ranches, Victory height primary school, Mediclinic, Blue Oasis Veterinary Clinic, Motor city Walk, City Center IMPZ, JVT Mall, Mall of the Emirates, Dubai Mall, Al Maktoum International Airport, Polo & Equestrian Club are very famous infrastructures which can be reached within driving distance from Zen residences. The master community Indigo Zen is delivered within Dubai Golf City at the intersection of Dubai Bypass Road & Al Qudra Road in Mudon, Dubai, UAE. These eco-friendly homes offers you all day to day facilities such as 2 Parking spaces in each villa, state of the art equipped kitchen, servant quarters, Landscaped parks, Garden, Clubhouse, Outdoor Parking, Gymnasium, Security, Kid's Play Area, Meditation Area, Sunken Pavilions, Jogging track, walking track, BBQ Area and much more.